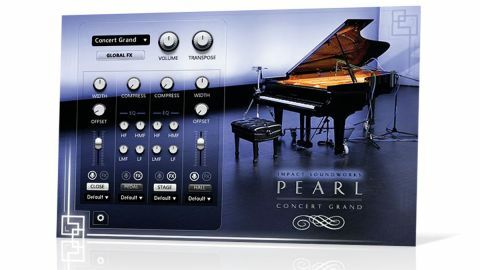 Pearl Concert Grand sounds lovely and plays well, holding its own against competing pianos costing considerably more. Well played, Impact Soundworks. Excellent sounds. Great to play. Represents excellent value. For Impact Soundworks' first serious piano library, a Yamaha C7 grand has been captured in "a concert hall" from four mic positions to generate over 14,000 samples, provided in 16- (12GB) and 24-bit (27GB) formats. "There's enough processing power to design any piano sound you're likely to need"
Eight velocity layers are in effect, with two round- robins per note, and completely separate sample sets for sustain pedal up and down. The interface gives control of volume, width, sample offset, EQ and compression for each of the four mic channels (Close, Pedal, Stage and Hall), as well as five effects - enough mixing and processing power to design any piano sound you're likely to need. Velocity scaling and microtuning are adjustable, as are key and pedal release noise, and the dynamic response of the instrument is totally customisable, right down to individual notes.